Historian Stanley Weintraub wrote in his book, Silent Night, how soldiers, after agreeing not to shoot each other, sang carols in an odd fraternity of inveterate enemies turned into momentary friends by their common belief in God and the tradition of Christmas, Christmas caroling, and Christmas trees. Shaking hands, in the old Germanic tradition of showing that they were not armed, they shared cigarettes and food. 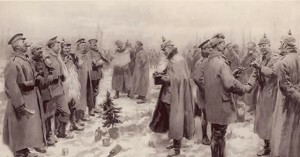 This entry was posted in History and tagged 1914, 2005 movie, British troops, Christmas Truce, French, German, Joyeau Noel, Ploegsteert, Silent Night, Stanley Weintraub, WWI by Admin. Bookmark the permalink.